Thank you to Tom Long '81 for participating in this Q&A. Why did you join Phi Delt as an undergraduate? I joined because it was a great fraternity, had super geographical diversity of membership, was fun and athletic, and I felt like I belonged there. What is the funniest memory from your Phi Delt days? There are too many and few appropriate to this venue. But one has to be Betty Boo, the house cook, chasing me and Chris Boone ’81 out of the kitchen and down the street for a late night food raid the previous night. The Beat Duke parade chaired by "Count" John Baicy ‘81, Richard "Moose" Long ‘78, Steve Raper ’79 and Jim Clement ‘81 has to be up there. What is the single fondest memory you have shared/will share with your children and grandchildren? It has to be the way David "push daddy" Jones ‘80 helped set me up with Elizabeth for a 13 hour road trip to Florida my sophomore year. He was dating Ann Cochrane and I weaseled myself into the spring break trip. I married Elizabeth a few years later. So thrice hail to David, I owe him. 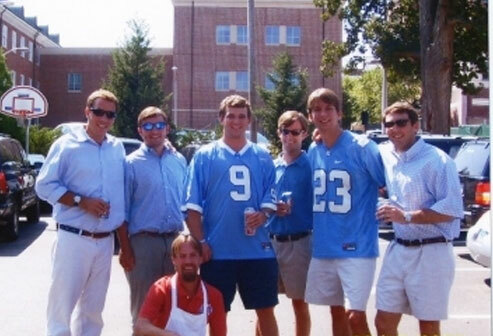 How do you stay connected with your brothers as an alumnus? Generally, the grapevine still works. That’s the informal news vehicle coined and operated by Jim Clement. Technology helps, and since I've got two daughters at UNC, Stewart Louise Long and Martha Rawlings Long (both KD's), I have reason to be at UNC more often to catch up. Chuck Duckett ‘83 is always a source of inside info, and I try to stay close to him. My brother Richard ’80 is also a good source. What about your membership in Phi Delt makes you the most proud? I'm proud that the current Phis guys have kept up their academics and athletics. Some of the brightest and most well rounded men grew up to a large degree in that house. And I believe they still do. I'm so proud to have been a classmate of John Cornick ‘81 and to have seen the love and care he gave to the house and to see that love and care repaid to him in some measure over the last couple of years. Where has life taken you since graduation? What's new in your life today? I've been lucky to move around the world a bit, but still stay close to my roots in North Carolina. I'm currently in the dream job of many American upper clansmen, the CEO of a beer company. We've got a fabulous brewery in Eden, NC, so I'm glad we provide lots of jobs in North Carolina, both through the brewery and through our distributor partners, many of whom are UNC grads, like Paul Weisler of Salisbury.